Turning Vision Into Action: Technology, Paradox, Five Disciplines and #plcleaders! Technology, Paradox, Five Disciplines and #plcleaders! I have had a tremendous technology mentor in my life over the years. Her name is Charlene Chausis. She is a teacher extraordinaire (An international technology educator of the year) and with great patience and skill has helped me to learn how to use twitter and this blog as a viable communication tool. And then along came Bill Ferriter (Solution Tree Author with Adam Garry of Teaching the iGeneration: 5 Easy ways to Introduce Essential skills with Web 2.0 tools) last winter and he pushed me further over the twitter edge and also patiently responded to my twitter questions and modeled for me how to "Get on Board". 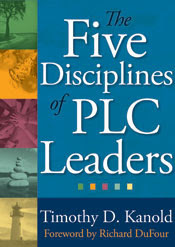 So, as I launch my first school leadership book with Solution Tree, The Five Disciplines of PLC Leaders, I invite anyone who reads this blog and even those that don't, to join me in ongoing twitter conversations at #plcleaders (pass it along). Use this hashtag (hashtag is such a strange word) every time you come across something you think would benefit those of us committed to the leadership of professional learning community school cultures. So far this "Community" has two postings, both by me. I am looking forward to seeing - err, reading you there. Enclosed is an excerpt from the Introduction of my Five Disciplines book. In a conversation with my oldest daughter Jessica over the weekend (she is a Junior High School administrator and former mathematics teacher) we were discussing the paradox of school leadership - how the best leaders we know have the right mix of confidence and doubt. As I started my school leadership career, I was confident on the outside yet still learning about myself and about the leadership of others on the inside. In hindsight, I probably had just the right mix of doubt and the necessary confidence to lead well. I have talked to many school leaders who started out the same way, and they have been relieved to hear they weren’t alone in the paradox of knowing just enough to understand that there was a lot they didn’t know. This book, if anything, gives you—the school leader—permission to take focused risks, make mistakes, and most importantly, learn from those mistakes. Understanding that you don’t fully know all the answers—and never will—is a paradox of leadership wisdom and an actual strength of PLC school leaders. 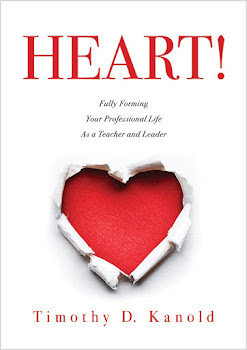 In this book, we will examine how PLC school leaders learn to act at the right times and in the right way and with the right amount of energy, engagement, grace, and compassion. We will see how they practice particular disciplines to become comfortable with the many paradoxes of effective school leadership—among them, leading by serving, engaging through strategic disengagement, allowing autonomous behaviors within defined boundaries, and inspiring through humility. For more information on the book, and its release, you can click here! Meanwhile, see you at #plcleaders! When I became an administrator, my mentor told me to always "be humbled by what you know." I keep on going back to this advice as it is so easy to lose focus as a leader when one gets frustrated about what he/she assumes others should already know. Being a true leader is operating with a growth mindset - the realization that even with so much already accomplished, there is still so much to learn and to continue to be humbled by the learning and the enrichment that can happen during the daily trials and tribulations of being a school leader. After attending an Administrator Academy last year with Will Richardson, I was convinced to join the Twitter revolution. I spent the better part of a year just "listening," over the last three months, I have begun to tweet on a regular basis. Being motivated by inspirational change leaders and expanding my own PLN as a result. Because of Twitter,I not only practice what I preach about Web 2.0 integration in to education, but I am a better administrator and thought leader as a result. I totally agree that school leaders must be willing to take some risks, as long as these are "focused" risks as you state. For me, the use of blogging and other 2.0 tools was risky when I started five years ago. I started with one blog that I used for both school and personal/family topics, and I had parents of my students reading. The risk was my willingness to open up about my personal life to my school community. Interestingly, the best comments I received from parents were related to my experiences raising my two daughters. I hope my use of web 2.0 tools has been a model for teachers in our school, and even though there is a risk involved, it is worthwhile. I took the Web 2.0 plunge a couple of years ago, and my life as an administrator has changed tremendously. My work has become more collaborative, efficient, and dynamic, and it's hard to imagine how we ever did things "way back then." I'm continually amazed and enthralled by the mind-boggling rate at which technology is advancing. In a recent interview, when asked what my hobbies were, I added experimenting with technology to my trusted cooking, traveling and reading response. However, much to my family's chagrin, I'm constantly plugged in. I feel a sense of guilt when I don't "check in" technologically because the communication expectation bar has been significantly raised over the past few years. We no longer embrace the 24 hour response time rule of thumb. Instead, we've developed an "urgency of now" mentality which has both pros and cons. I'm a real tech junkie, and I'm never going back, but as much as I like the "plugged in" version of me, I like the "unplugged" version a little bit better. It's all about balance...ah, balance. Like Jill, I attended an administrator academy with Will Richardson and felt instantly inspired. Reading this passage reminds me that I must move beyond my comfort zone to take the necessary risks to grow as a leader and an educator. I consistently encourage both students and staff to take risks and learn from their mistakes. It is time to practice what preach. As the mother of a three year old I need to get on board with my personal and professional use of web 2.0 tools as it is only a matter of time before my daughter’s knowledge surpasses mine. I would love to say that I fully embrace the benefits of Web 2.0, but I can't. As much as I believe in the efficiency and effectiveness that this technological philosophy can provide me, my professional fears stop me from truly exploring it to the extent possible. I am hesitant due to the implications of FOIA. My friends and colleagues will tell you that I am overreacting, and I would love to believe this is the case. However, I can't seem to overcome the fear. In some ways, I think I am set-up for not overstepping my role and being put in a precarious situation of saying something that I should not say. On the other hand, am I being true to myself? Am I embracing the instructional effect that I can provide to a greater community because of the fear of saying too much...not even close. "They weren’t alone in the paradox of knowing just enough to understand that there was a lot they didn’t know." Nothing sums up the experience of being a new administrator better. Was it Socrates who said he was the smartest man in the world because he knew what he didn't know? Then I was a genius when I became an administrator! Now, as Web 2.0 continues to grow and change I'm paradoxical in my attitude towards it and its' implications in schools. While I firmly believe that we must embrace the world our students are growing up and learning in, it comes with pitfalls and potential stumbling blocks. While the law catches up with how to deal with cyber-behavior, we must be cautious as we venture forward. Every word, every posting, every tweet can be copied, re-distributed, parsed, analyzed, and scrutinized and we have to, more than ever before, remember that we are public figures and that our words have weight and meaning. As an educational leader, one must be willing to serve and subordinate oneself to the vision and best interest of the organization. As leadership includes developing and articulating a vision, it should be noted that it is not the sole perspective of the leader but something that reflects the collective vision of the school community. It is important to serve and not always be served. Leadership includes humility and putting students first. I am comforted to read about the balance between confidence and doubt (like the school leaders mentioned in the excerpt above). I have always have viewed my role as a first year principal - and first year in an elementary school - as a year to establish my values and to highlight my support for the teachers. As the year comes to an end, I believe the I have struck an appropriate balance. There were times during the year when I needed to be the change agent and times when I was a listener. There were times when I was confident in my decision and times when I allowed myself to be more vulnerable. Both ends of the spectrum work when in different situations/predicaments. And, I strongly believe that teachers appreciate a leader who can stand by his or her decision or admit wrongdoing when necessary. I subscribe wholeheartedly to the idea of a balance between confidence and doubt defining the effective school leader. If you portray yourself as (or worse, truly believe) that you know everything as a leader you are lying to yourself and everyone else around you. That lie will eventually catch up to you as well. In all professions, including school leadership, there is always great potential for growth and understanding. With that comes the realization that you never will know it all and you must listen and learn from those around you. If you are able to effectively communicate that you have doubt and you are growing you instill trust in those around you more so than someone who just displays confidence. The concepts of confidence and doubt make a lot of sense. I believe that a leader must possess the confidence in order to develop trust, implement a vision, and remain credible. The other side of that same coin is the doubt that leads one to constantly be focused on getting better, willing to stay in touch with current and best-practices, and maintain a reliability in leading by example. Movement toward positive changes does not happen without the courage to lead and vision...the key is the fact that one can never be certain in always having the right answers or in knowing how success in one venue or with one group of students/staff members will lead to the success with another. The doubt keeps the leaders honest and on the path of creating positive impact. As stated, the key is the balance. This comes with time, experience, and a dedication to the vision. This is a great teaser for the book. I agree that leaders need to balance the idea of confidence and doubt during their leadership decisions. I believe that one of the biggest variables in leaders finding that balance is their support system. As new administrators you need to surround yourself with supports that will promote your independent decision making but also allow for collaboration and support for difficult decision. Successful leaders have a strong support system that promotes focused risk taking, permits mistakes, and provides opportunities to learn from the mistakes. Taking risks as a leader is always a little scary, and very neccessary. I've observed leaders that stumble a bit, and then take a step back from making needed changes because they are thrown from making mistakes. It is refreshing that you are validating the notion that all leaders make mistakes, and we need to learn from those mistakes while we continue to take risks. I love the observation that we need to balance the "right amount of energy, engagement, grace, and compassion" because leading is truly is making adjustments all of the time. I've definitely struggled with finding the balance between confidence and insecurity in my first few years as an administrator. The line that hit home for me most here is your advice to "take focused risks, make mistakes, and most importantly, learn from those mistakes." I've made countless errors in the last few years. Some of them resulted in hurt feelings, duplicated work, lost friendships, and impacted achievement. However, I can thankfully say that, with rare exception, I have not made the same mistake twice. It is unfortunate that school leaders, even new ones, are often expected to have all of the answers and that people who lack answers are often perceived as weak leaders. How can a PLC leaders support one another through some of the tough decisions that face our schools as we leap toward the era of Common Standards, increased rigor, and limited budgets?